The interior style delivers the toughness and functionality desirable in a working vehicle, as well as the convenience and augmentation expected in a private use vehicle. With the Hilux, there’s no sparing on comfort and style. 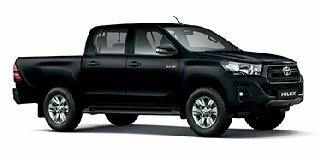 Also, the Hilux does not compromise on space, the front seats has extra space and pockets, overhead and centre console. There is also a dual compartment glove box and the top compartment acts a cool box*. There is plenty of space and seat ergonomics mean extraordinary driving comfort for the driver and passengers. The Double Cab interior layout is angled so that it’s easy to change the configuration. The convenient tip-up rear seats feature a 60:40* split.